Details of the Liraglutide Effect and Action in Diabetes: Evaluation of Cardiovascular Outcome Results—A Long Term Evaluation (LEADER) trial of the glucose-lowering drug liraglutide (Victoza, Novo Nordisk), showing that it significantly reduced the rates of major adverse cardiovascular events in type 2 diabetes patients at elevated cardiovascular risk, were reported today. The study is the second suchmandated FDA cardiovascular safety study for a diabetes drug to show cardiovascular benefit, rather than just lack of harm, on top of standard therapy in type 2 diabetes patients at high cardiovascular risk after the EMPA-REG trial, and the first with an agent from the glucagonlike peptide 1 (GLP-1) receptor agonist class. Results of a previous trial with another GLP-1 agonist, ELIXA, were neutral. Experts here said that LEADER andEMPA-REG may now begin to change the landscape of diabetes therapy, giving doctors a somewhat clearer choice when deciding which drug to use second line after metformin in type 2 diabetes. 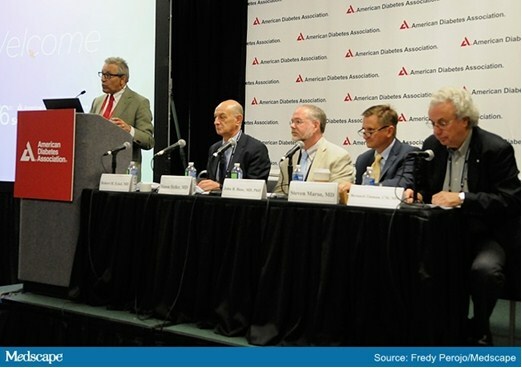 The results from the multicenter, international study were presented June 13, 2016 here at the American Diabetes Association (ADA) 2016 Scientific Sessions and were published online simultaneously in the New England Journal of Medicine, by Steven P Marso, MD, of University of Texas Southwestern Medical Center, Dallas, and colleagues. LEADER began in 2010 and followed 9340 high-risk adults with type 2 diabetes for 3.5 to 5 years, who were randomly assigned to receive either a subcutaneous injection of liraglutide 1.8 mg once daily (or the maximum tolerated dose) or placebo along with standard treatment. The primary end point was the first occurrence of the three-point major adverse cardiac event (MACE) components: cardiovascular death, nonfatal myocardial infarction (MI), or nonfatal stroke. The degree of risk reduction for MACE was 13% (occurring in 608 of 4668 patients taking liraglutide) vs 14.9% (in 694 of 4672 taking placebo) (P = .01 for superiority), including a 22% lower rate of cardiovascular death (4.7 vs 6.0%, P = .007), Dr Marso reported in a press briefing held at the ADA meeting in advance of a special 2-hour symposium devoted to the findings. The number of patients who would be needed to treat to prevent one event in 3 years was 66 for the MACE composite and 98 for death from any cause. Liraglutide also reduced HbA1c, body weight, and hypoglycemia, and its safety profile was similar to what has been seen in previous trials, with gastrointestinal adverse events and increases in heart rate being the most common. Coming on the heels of the cardiovascular benefit seen for the sodium glucose cotransporter-2 (SGLT-2) inhibitor empagliflozin (Jardiance, Boehringer Ingelheim/Lilly) in the EMPA-REG trial, the LEADER findings have experts talking about a “new era” in the management of type 2 diabetes. “In type 2 diabetes, most of us agree that under most circumstances metformin is the drug of choice,” briefing moderator Robert H Eckel, MD, of the University of Colorado, Denver, said, noting that additional potential cardiovascular and also anticancer benefits have been seen with that drug as well. However, he said, “It’s interesting, with LEADER the benefit for cardiovascular death is very similar to what statins do. I think with validation, it could potentially change practice….I’d like to see second and third trials for both [liraglutide and empagliflozin]. Keep in mind there are 25 or 30 trials for statins showing benefit,” said Dr Eckel, who was not involved in LEADER or EMPA-REG. Senior investigator of LEADER, John Buse, MD, of the University of North Carolina, Chapel Hill, added: “I think this changes the conversation with patients. Now, instead of just saying we’re giving you this drug to manage your hyperglycemia in diabetes, [we can say] this drug also has the potential to modify your risk for cardiovascular disease and death. “It was beyond our expectations that we would be able to demonstrate cardiovascular efficacy,” he told the press briefing. Asked to comment, Simon Heller, MD, professor of clinical diabetes, University of Sheffield, United Kingdom, toldMedscape Medical News, “I think we are in a different era now. People die from hypoglycemia, whether by insulin or sulfonylureas. We shouldn’t forget that. Patients could be drug-naive or taking oral agents or basal insulin but not other GLP-1 agonists or DPP-4 inhibitors, pramlintide, or rapid-acting insulin. In both treatment and placebo groups, current standards of care were targeted for HbA1c, blood pressure, lipids, and antiplatelet therapy. Subjects had a mean baseline age of 64 years, diabetes duration 13 years, and HbA1c 8.7%. At 36 months’ postrandomization, HbA1c levels were 0.40 percentage points lower in the liraglutide group, a significant difference (P < .001). Body weight also dropped significantly, by 2.3 kg (P < .001). Overall, results for each of the components of the composite primary MACE outcome were in favor of liraglutide, with a 22% reduction in cardiovascular death (4.7% vs 6.0%, P = .007), which was significant, and a nonsignificant 12% reduction in nonfatal MI (6.0% vs 6.8%, P = .11) and an 11% lower rate of nonfatal stroke (3.4% vs 3.8%, P = .30). Also significant were a 15% reduction in all-cause death (8.2% vs 9.6%, P = .02) and an expanded composite CV outcome that included coronary revascularization, unstable angina, or hospitalization for heart failure (20.3% vs 22.7%, P = .005). The prespecified primary microvascular outcome in LEADER was a composite of nephropathy and retinopathy outcomes, and there was a benefit with liraglutide over placebo: time to first renal event was 22% longer with liraglutide, a significant difference. However, this latter effect drove the benefit, as there was no significant difference in retinopathy events between the two groups. Overall adverse events occurred in two-thirds of both treatment groups and were not significantly different (P = .12). Serious adverse events occurred in 50% of both groups and severe events in a third of both (P = .51). Adjudicated cases of acute pancreatitis occurred in 0.4% of patients taking liraglutide compared with 0.5% on placebo (P = .44). There were two cases of chronic pancreatitis, both in the placebo group. However, acute gallstone disease was more common with liraglutide, 3.1% vs 1.9% (P < .001). Hypoglycemia was more common in the placebo group, both with overall confirmed cases of blood glucose levels below 56 mg/dL (43.7% with liraglutide vs 45.6% with placebo, P < .001) and in severe hypoglycemia requiring assistance (2.4% vs 3.3%, P = .016). The likely reason for this, Dr Eckel noted, is that the placebo patients may have been treated more intensively with insulin in attempt to achieve HbA1c targets. Neoplasms were not different between the groups except for a 46% reduction in prostate cancer (0.9% vs 1.6%) and a lower rate of leukemias (0.1% vs 0.3%) in the liraglutide group. There was a numeric increase in the number of pancreatic-cancer cases with liraglutide (13 vs five) for a higher rate of pancreatic cancer in the liraglutide group (0.3% vs 0.1%), but four more cases were identified on imaging in the placebo group that did not have pathology to establish the diagnosis, so the two groups were not significantly different, Dr Buse noted. Dr Eckel said that the results of LEADER follow in the same vein as those of EMPA-REG. But the LEADER investigators note some differences in how the drugs may be working. The observed benefits in EMPA-REG “may be more closely linked to hemodynamic changes, whereas in the present trial, the observed benefits are perhaps related to the modified progression of atherosclerotic vascular disease,” they conclude. Dr Marso reports grants and personal fees from Novo Nordisk during the conduct of the study and personal fees from Abbott Vascular and AstraZeneca outside the submitted work. Disclosures for the coauthors are listed on the journal website.